Loanable stock Issues are selected, on the basis of certain criteria, from all issues listed on stocks exchanges. In principle, the due date of loan is the business day following the lending date, but can be extended to 6 months at the longest. Interest rate on Money Lending Interest rate on Money Lending should be paid by securities companies which borrow funds from JSF. Interest rate on Collateral Money for Stock Lending Interest rate on Collateral Money for Stock Lending should be paid by JSF to the securities companies which borrow stocks from JSF. Interest rate on Loans for Margin Transactions is determined based on the short-term money market interest rate. Securities companies that borrow stocks should pay to JSF a lending fee, which is calculated by multiplying the value of the stocks by a certain rate. 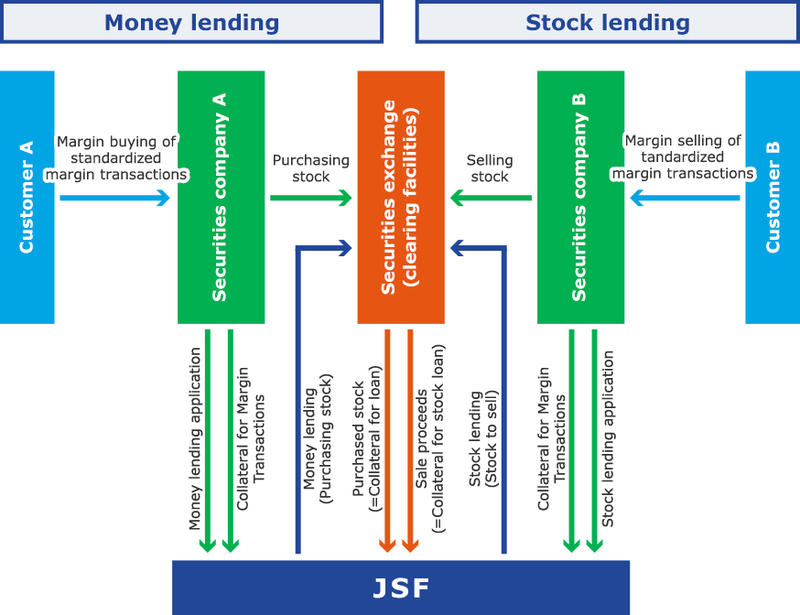 JSF receives margin requirements in addition to stocks purchased or proceeds of sale as collateral for Money Lending or Stock Lending. The amount of margin requirements is calculated as a certain percentage of Money Lending and Stock Lending and to be deposited with cash in principle, but can be substituted by securities including equity and bond.